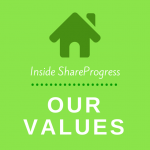 ShareProgress is (as you might guess from the name) a company committed to progressive change. We were founded on the belief that it’s possible to build a successful company that also has a strong social mission. Here’s what that means to us, and what we’re doing to live it out as an organization. Progressive like Democratic? Sure, but that’s not all. Straight from our mission statement: “For us, progressive means more than just the political left. It describes any organization working to help and protect the less fortunate amongst us or to make life better for the population at large: improving our cities, protecting our environment, encouraging civic engagement, fighting for economic justice, and providing training and opportunities for those who haven’t traditionally had access to them.” It’s a big umbrella, and we’re incredibly proud and grateful to have the chance to help amazing organizations like the AFL-CIO, the National Organization for Women, the Sierra Club, Berim, Enroll America, Compassion & Choices, and ColorOfChange through the work we do. So how are we working towards progressive change? We have three ways that we’ve committed to making change from within our organization. We’re focused on working with organizations that share our progressive values (although nonpartisan organizations are allowed to use ShareProgress tools, too). We don’t accept work with Republican campaigns or committees for those same reasons. We’re giving back. One percent of our revenue is donated to progressive nonprofits chosen by members of the ShareProgress team. That’s our way of supporting organizations doing the work we think is critical. As always, let us know what you think–either in the comments, via email, or on Twitter @ShareProgress.